Received November 9, 2017; Revised May 10, 2018; Accepted June 25, 2018.; Published online July 10, 2018. Spermatogonial stem cells (SSCs) derived from mouse testis are unipotent in regard of spermatogenesis. Our previous study demonstrated that SSCs can be fully reprogrammed into pluripotent stem cells, so called germline-derived pluripotent stem cells (gPS cells), on feeder cells (mouse embryonic fibroblasts), which supports SSC proliferation and induction of pluripotency. Because of an uncontrollable microenvironment caused by interactions with feeder cells, feeder-based SSC reprogramming is not suitable for elucidation of the self-reprogramming mechanism by which SSCs are converted into pluripotent stem cells. Recently, we have established a Matrigel-based SSC expansion culture system that allows long-term SSC proliferation without mouse embryonic fibroblast support. In this study, we developed a new feeder-free SSC self-reprogramming protocol based on the Matrigel-based culture system. The gPS cells generated using a feeder-free reprogramming system showed pluripotency at the molecular and cellular levels. The differentiation potential of gPS cells was confirmed in vitro and in vivo. Our study shows for the first time that the induction of SSC pluripotency can be achieved without feeder cells. The newly developed feeder-free self-reprogramming system could be a useful tool to reveal the mechanism by which unipotent cells are self-reprogrammed into pluripotent stem cells. Spermatogonial stem cells (SSCs) are unipotent stem cells involved in spermatogenesis in the testis. These cells self-renew in seminiferous tubules and differentiate to generate sperm (Tegelenbosch and de Rooij, 1993). Although SSCs are an extremely rare population (0.02–0.03%) in the adult testis (Dann et al., 2008; Kanatsu-Shinohara et al., 2003b; Kehler et al., 2004; Ko et al., 2009; Tegelenbosch and de Rooij, 1993), SSCs can be isolated and established as SSC cell lines in vitro (Kanatsu-Shinohara et al., 2003a). It has been known that SSCs produce two SSCs or progenitor cells in the testis (Kanatsu-Shinohara et al., 2016). Therefore, in vitro cultured SSC lines may also comprise a population of stem cells and progenitor cells with self-renewal potential. SSCs require the expression of Oct4, which is a pluripotency-and germ-cell-specific maker necessary for survival and maintenance of stemness properties (Dann et al., 2008). Oct4 is expressed only in a limited number of cell types, such as embryonic stem cells (ESCs), epiblast stem cells, induced pluripotent stem cells (iPSCs), primordial germ cells, SSCs, and female germ cells in the ovary (Brons et al., 2007; Page et al., 2007; Pesce and Scholer, 2000; Scholer et al., 1990; Niwa, 2001). To date, SSCs are the only adult stem cells shown to exhibit significant Oct4 expression. Functional studies revealed that disruption of Oct4 activity in cultured SSCs resulted in the loss of proliferation and spermatogenic differentiation ability (Dann et al., 2008). Unipotent SSCs from postnatal day 0–2 testis can be spontaneously dedifferentiated into pluripotent stem cells during derivation of SSCs (Kanatsu-Shinohara et al., 2004). Thereafter, our previous study demonstrated that adult SSCs can also be converted into ESC-like cells, so-called germline-derived pluripotent stem (gPS) cells (Ko et al., 2009; 2010; 2012). Our original protocol for derivation of gPS cells required mouse embryonic fibroblasts (MEFs) as feeder cells to provide a certain microenvironment for the induction of pluripotency in SSCs. Because living cells in feeder layers secrete a number of protein factors, their use results in uncontrollable variability and might affect reprogramming. In addition, contamination with MEFs may be unavoidable when SSCs are collected for mechanistic studies. For these reasons, feeder-free culture conditions for reprogramming of SSCs into pluripotent cells are desirable. Previously we developed a Matrigel-based feeder-free culture system for proliferation of SSCs, which is time- and cost-effective (Choi et al., 2014). In the current study, we examined whether the pluripotency of unipotent SSCs can be induced using the Matrigel-based culture system without feeder cells, and established a feeder-free system for derivation of gPS cells (FF-gPS cells). Establishment of SSCs from Oct4-GFP/LacZ transgenic mice (C57BL/6 background) was described previously (Ko et al., 2009; 2010; 2012). SSC medium for expansion was composed of StemPro-34 SFM (Gibco) with the following supplements: StemPro supplement (Gibco), 1× N2 supplement (Gibco), 6 mg/ml d-(+)-glucose (Gibco), 30 mg/ml pyruvic acid (Gibco), 1 μl/ml DL-lactic acid (Sigma-Aldrich), 5 mg/ml bovine serum albumin (BSA; Gibco), 1% fetal bovine serum (Gibco), 2 mM L-glutamine (Gibco), 50 μM β-mercaptoethanol (Gibco), 1×penicillin/streptomycin (Welgene), 1× minimal essential medium (MEM) non-essential amino acids (Gibco), 1× MEM vitamins (Welgene), 30 ng/ml β-estradiol (Sigma-Aldrich), 60 ng/ml progesterone (Sigma-Aldrich), 20 ng/ml human EGF (Peprotech), 20 ng/ml human bFGF (Peprotech), 20 ng/ml human GDNF (Peprotech), and 103 U/ml murine leukemia inhibitory factor (Prospec). Culture plates were coated with Matrigel (BD Biosciences). As follows. A Matrigel bottle was thawed in a 4°C refrigerator overnight until Matrigel liquefied. Matrigel was divided into 300 μl aliquots and stored at −20°C until use. For plate coating, working solution was prepared by diluting 300 μl of Matrigel with 29 ml of DMEM/F12 medium (Gibco) and thorough mixing. This solution was added to 12-well plates (0.5 ml per well) or 6-well plates (1 ml per well) to cover the whole surface of the wells. The plates were allowed to sit for 1 h at room temperature or overnight at 4°C. Excess Matrigel solution was then removed, and the plates were washed once with DMEM/F12. SSCs were maintained on feeder-free Matrigel-coated12-well plates, SSC media were changed once every two days and passaged every 5 days. SSCs were detached from the dish mechanically by pipetting and then spun down at 1,300 rpm for 5 min. Cells were counted at each passage, replated at 5 × 105 cells/well and cultured as described previously (Choi et al., 2014). SSCs cultured under expansion conditions were dissociated into single cells by trypsinization. Approximately 250,000 cells were plated per well in 24-well plates in SSC culture medium. For the analysis of gPS cell generation efficiency, 1,000 to 500,000 SSCs were plated per well in 24-well plates. The medium was changed every 2 to 3 days, but the culture was maintained without splitting until appearing gPS cell colony. To expand the gPS cells, the colonies were enzymatically dissociated by 0.25% Trypsin-EDTA into single cells, After inactivation with 10% FBS, the cells were incubated in a gelatin-coated dish for 20 minutes, repeated twice to remove feeder cells and then transferred on mitomycin treated new feeder cells. SSCs were cultured under ESC culture conditions at 37°C in an atmosphere of 5% CO2 in air. Total RNA was isolated by using RNeasy Mini Kit according to the manufacturer’s instructions (QIAGEN). Total RNA (500 ng) was reverse-transcribed by using the OmniscriptRT Kit (QIAGEN) in a total volume of 20 μl. PCR analysis was performed with gene-specific primers and Takara Ex Taq DNA polymerase (Takara) according to the manufacturer’s instructions. The PCR conditions were as follows: 32 cycles at 94°C for 30 s, 50–65°C for 30 s, and 72°C for 30 s. The RT-PCR products were analyzed by electrophoresis in 1% agarose gels. For quantification of gene expression, expression levels were evaluated by quantitative RT-PCR using a 7500 Real-Time PCR System (Applied Biosystems) and SYBR Green (Thermo Scientific, K0221). Primer sequences are listed in Supplementary Table S1. Cells were fixed in 4% paraformaldehyde (Sigma-Aldrich) for 15 min at room temperature, washed 3 times with DPBS, and then incubated in DPBS containing 0.5% Triton X-100, 1% bovine serum albumin (BSA) fraction V (both from Sigma-Aldrich), and 10% fetal bovine serum for 10 min at room temperature. The cells were briefly rinsed with DPBS and incubated with primary antibodies overnight at 4°C or for 1 h at room temperature. The following primary antibodies were used: mouse monoclonal anti-SSEA1 (DSHB, 1:200), mouse monoclonal anti-Tuj1 (Millipore, 1:200), mouse monoclonal anti-SMA (R&D Systems, 1:200) and mouse monoclonal anti- AFP (R&D Systems, 1:200). The cells were then washed with 0.5% BSA in PBS and incubated with secondary antibodies (anti-mouse IgG or anti-mouse IgM; both from R&D Systems, 1:200) for 1 h at room temperature. Nuclei were detected by Hoechst 33342 (Fluka) staining. Cells were washed with PBS, and genomic DNA was isolated using the Total DNA Extraction kit (iNtRON) according to the manufacturer’s protocol. Genomic DNA was treated with Epi-Tech Bisulfite (QIAGEN) according to the manufacturer’s recommendations, and used for PCR amplification. The PCR products were cloned using the PCR Cloning kit (QIAGEN). To differentiate gPS cells into three germ layers, previously described protocols (Brustle et al., 1999; Igelmund et al., 1999) were applied to embryoid body derived from gPS cells. Embryoid bodies were attached gelatin coated plates, cultured with MEF medium until beating cells formed. MEF medium was composed of Low-glucose DMEM (Welgene) with the following supplements: 10% fetal bovine serum (Gibco), 50 μM β-mercaptoethanol (Gibco), 1×penicillin/streptomycin (Welgene), 1×minimal essential medium (MEM) non-essential amino acids (Gibco). Experiments were conducted under protocols approved by the Konkuk University Animal Care and Use Committee. FF-gPS cells were aggregated and cultured with denuded post-compacted mouse embryos. Briefly, 8-cell-stage embryos were flushed from mice (C57BL/6 albino) at 2.5 dpc and placed in M2 medium. Clumps of loosely connected gPS cells (10–20 cells) from short trypsin-treated day-2 cultures were selected and transferred into microdrops of KSOM medium with 10% FBS under mineral oil; each clump was placed in a depression in the microdrop. Meanwhile, batches of 30 to 40 embryos were briefly incubated with acidified Tyrode’s solution until the zonapellucida had disintegrated. A single embryo was placed onto each clump. All aggregates were cultured at 37°C in an atmosphere of 5% CO2 in air. After 24 h of culture, the majority of the aggregates had formed blastocysts. Approximately 11 to 14 aggregated embryos were transferred into the uterine horn of a 2.5 dpc pseudopregnant mouse. The microarray study was carried out using Illumina MouseRef-8v2.0 Expression BeadChips, previously described (Ko et al., 2009; 2010; 2012). Quality-checked cRNA samples were hybridized for 18 h onto mouse-8 v2 expression Bead-Chips (Illumina), washed, stained, and scanned following guidelines and using materials / instrumentation supplied/suggested by the manufacturer. Karyotype analysis was conducted at the Korea Research of Animal Chromosomes (KRACH) using standard protocols for high-resolution G-banding. gPS cells were plated on Matrigel coated 25 T flasks, next day treated with 10 μg/ml colcemid (Gibco) to arrest cells in metaphase. After 4 h, gPS were incubated with hypotonic solution for 25 min at 37°C. gPS cells were detached from the flasks and then centrifuged. The cell pellets were resuspended in fixative solution (methane : acetic acid = 3 : 1). Resuspended gPS cells were transferred onto cold wet slides, and subjected to trypsin and Giemsa (Sigma-Aldrich) for GTG-banding. To induce the pluripotency of SSCs, SSCs derived from Oct4-GFP transgenic mouse testes were plated (1 × 105 cells per well) in a 24-well plate coated with Matrigel and maintained in culture (Choi et al., 2014). GFP derived by Oct4 promoter in SSCs under expansion condition were expressed at low level in comparison to other pluripotent stem cells, which confirmed by quantification analysis using real time PCR (Supplementary Fig. S1). However, high expression of Oct4-GFP started to appear after 3 weeks of expansion culture and formed colonies with high GFP intensity 1 to 2 weeks later (Figs. 1A and 1B). Supplementary Fig. S2 gives an overview of the procedure. These cells were morphologically distinct from typical SSCs, showing mESC-like colonies, which were gPS cell colonies. To expand gPS cells, Oct4-GFP–positive colonies were transferred on MEFs in mESC medium. Feeder-free-derived gPS cells (FF-gPS cells) were morphologically similar to mESCs (Fig. 1C), expressed high levels of Oct4-GFP (Fig. 1D), and stained positive for SSEA-1 and alkaline phosphatase (Figs. 1E and 1F). To examine whether the initial number of plated SSCs was critical for the induction of their pluripotency in the feeder-free culture system, SSCs were plated in 24-well plates at 1 × 103 to 5 × 105 cells per well and their conversion into gPS cells was assessed. We found that pluripotency was not induced if less than 1 × 104 were plated, while gPS cell conversion was observed in the wells with 5 × 104 cells (Supplementary Fig. S3). We performed replicate experiments 7 times. We found that gPS cell colonies were detected in 29 wells out of 84 wells of 48-well plate, when 100,000 SSCs were initially plated in one well of 48-well plate. We estimated that about 0.000369% of the plated SSCs (100,000 per well) had been converted into gPS cells within 4 weeks of culture. We analyzed the expression of genes specific to mESCs in gPS cells by RT-PCR (Fig. 2A). Global gene expression profiling analysis demonstrated that FF-gPS cells showed expression patterns similar to those in gPS cells derived from a feeder culture and mESCs (Fig. 2B). We also performed quantitative RT-PCR to prove similarity in expression of pluripotent marker gene, Oct4 and Nanog (Supplementary Fig. S4). 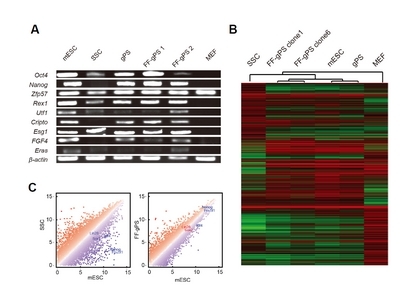 Scatter plots of gene array analyses indicated that the RNA expression pattern in gPS cells derived from feeder-free SSCs was similar to that of mESCs rather than SSCs (Fig. 2C). DNA methylation analysis showed that the promoter regions of Oct4 and Nanog were unmethylated in gPS cells, as in ESCs (Supplementary Fig. S5). Heatmap analysis with hierarchical clustering revealed that global gene expression in FF-gPS cells was similar to those of mESCs as well as gPS cells derived from feeder culture system (Fig. 2C). Therefore, in terms of global gene expression patterns, FF-gPS cells are equivalent to gPS cells derived from the MEF-based feeder culture system (Fig. 2B). Previous studies have shown that various stem cells exhibit chromosome abnormalities during long-term culture (Diaferia et al., 2011; Fan et al., 2011; Gaztelumendi and Nogues, 2014; Josse et al., 2010; Liu et al., 1997; Luft et al., 2014; Miura et al., 2006; Rebuzzini et al., 2008a; 2008b; 2012; 2015). Our FF-gPS cells was reprogrammed from SSCs passed in vitro over 100 passages, and various chromosome abnormality could be induced. Because of this, we conducted cytogenetic analysis in our gPS cells for various chromosome abnormality. Cytogenetic analysis revealed karyotype of 41,XY,+1/41,XY,+12/40~42,X,−Y, −2, −4,+8, +10, −11, −13,+14, −14, −16,+6,+8,+12,+15,+19,inc[cp18] among 30 in cultured gPS cells and karyotype of 43,XY,+6,+8,+12 in all cultured FF-gPS cells (Supplementary Table S2). These results are consistent with the findings of the abovementioned previous studies that abnormalities may occur in the chromosome during long-term culture. Although abnormalities of the chromosome are found, it is not considerable in this study due to the fact that this experiments were designed for basic SSC reprogramming research, not for clinical applications and medical research. Our previous study demonstrated that DNA methylation patterns of the differentially methylated regions (DMRs) of imprinted genes are not changed even after conversion into gPS cells (Ko et al., 2009). To investigate whether the DNA methylation patterns of the paternally imprinted gene H19 and the maternally imprinted gene Snrpn were maintained in FF-gPS cells, we performed bisulfate DNA sequencing analysis. The sequence data showed that the DMR of the H19 gene was hypermethylated, whereas that of Snrpn was hypomethylated in feeder-free gPS cells (which is an androgenetic pattern similar to that in gPS cells derived from the feeder culture system), whereas mESCs showed somatic patterns (Fig. 3). The androgenetic patterns of H19 and Snrpn in FF-gPS cells indicate that they originated from SSCs. To determine the pluripotency of FF-gPS cells, we analyzed their ability to differentiate in vitro and in vivo. In an in vitro assay, we examined FF-gPS differentiation into the three germ layers from embryoid body formation (Brustle et al., 1999; Igelmund et al., 1999). We observed cells differentiated from FF-gPS cells that stained positive for Tuj1, a neuronal cell marker, SMA, a mesodermal cell lineage marker, and AFP endodermal cell lineage marker (Figs. 4A–4C). To confirm the in vivo differentiation ability of FF-gPS cells, we transplanted them into immuno-deficient mice to generate teratomas. The presence of teratomas containing derivatives from all three germlayers indicated that FF-gPS cells were able to differentiate in vivo (Figs. 4D–4F). 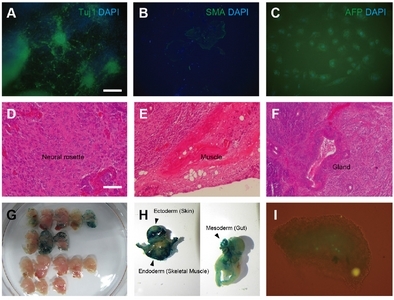 To assess the differentiation capability of gPS cells in vivo, a teratoma assay was performed injecting subcutaneously gPS cells into SCID mice. Within 4 weeks of transplantation, teratomas had formed. In the H&E analysis staining a section of teratoma revealed that tissues contained all three germ layers, it was confirmed that FF-gPS cells were able to differentiate into ectoderm (neural rossette), endoderm (muscle) and mesoderm (gland) (Figs. 4D–4E). To further assess the pluripotency of FF-gPS cells, we investigated chimera formation after blastocyst injection of FF-gPS cells. The chimera analysis revealed contribution of FF-gPS cells to all three germ layers, skin chimerism in skin (ectoderm), skeletal muscle (endoderm), gut (mesoderm), and to germ cells confirmed by Oct4-GFP positive cells in the fetal gonads of chimeric embryos (Figs. 4G–4I). Our results clearly show that FF-gPS cells have pluripotency that they are able to differentiate into three germ layers and contribute to the germline. SSCs have a unique self-reprogramming property: in these cells, pluripotency can be induced under certain culture conditions without overexpression of exogenous reprogramming factors. Previously we showed that pluripotency can be induced in SSCs when they are cultured on feeder cells without splitting (Ko et al., 2009). gPS cell colonies were observed within 3–4 weeks of maintaining SSC cultures on feeder layers. Accordingly, feeder cells were required for creation of microenvironment to induce pluripotency in SSCs. However, the question was whether the co-culture with feeder cells is necessary for SSCs to self-reprogram into pluripotent cells. To address this question, in the current study we have investigated whether the pluripotency of SSCs can be achieved under feeder-free culture conditions established in our previous study (Choi et al., 2014). Matrigel has been widely accepted as an alternative substrate for the culture of human ESCs and iPSCs (Drukker et al., 2012; Hammerick et al., 2011; Page et al., 2007; Xu et al., 2001; 2004). We also reported that Matrigel supports expansion and differentiation of mouse neural stem cells (Lee et al., 2015). In this study, we have established a feeder-free culture system for reprogramming of SSCs into gPS cells. The pluripotent characteristics (gene expression profile and differentiation potential) of FF-gPS cells are equivalent to those of gPS cells derived using feeder cells as well as mESCs. Our findings demonstrate that the right microenvironment required for the induction of pluripotency in SSCs can be achieved without their interaction with feeder cells. It was reported that overexpression of Oct4, Sox2, c-myc, and Klf4 by viral infection is able to reprogram iPS cells (Takahashi and Yamanaka, 2006). This suggests that the expression of these reprogramming factors might be a major cue to obtain pluripotency in any cell type. Previously, we have shown that Oct4 alone can reprogram NSCs (Kim et al., 2009), another group has demonstrated that pluripotency can be induced even in fibroblasts by overexpression of Oct4 plus small molecules (Li et al., 2011), suggesting that Oct4 may be the major reprogramming factor. Interestingly, SSCs are the only adult cell type expressing Oct4 mRNA, although the protein is expressed at low levels. It still remains to be addressed how the expression of Oct4 and other reprogramming factors in SSCs is increased to the level sufficient for the induction of pluripotency in our experimental system. If we identify these molecular cues, we can understand the upstream mechanism of the induction of pluripotency by these reprogramming factors. To elucidate whether reprogramming efficiency depends on cell density, we plated SSCs at 1,000 to 500,000 cells per well in 24-well plates and found that SSCs were reprogrammed into gPS cells at a cell density of 50,000 to 500,000 but not below 10,000 cells, apparently because SSCs did not proliferate and did not survive for a long time. These results imply that gPS cell generation requires a certain microenvironment created by proliferating SSCs, which triggers the induction of pluripotency of SSCs. This cell number–dependent reprogramming was also observed in the feeder-based induction protocol described in our previous study (Ko et al., 2009). FF-gPS cells have the same morphology and characteristics as mESC and gPS cells. However, they maintain an androgenetic pattern of methylation in the DMRs of H19, while the unmethylated status of Snrpn remained unchanged in our FF-gPS cells. This divergence is crucial evidence that FF-gPS cells originated from feeder-free SSCs. SSCs are the only cells that are self-sufficient in terms of conversion into pluripotent stem cells. Nevertheless, it is still unclear how their transition from the unipotent into pluripotent state is induced. In this study, we investigated whether interactions with feeder cells and the microenvironment are necessary for reprogramming of SSCs into pluripotent cells, and proved for the first time that pluripotency can be induced in SSCs without feeder cells. The feeder-free self-reprogramming culture system established in this study minimizes variability possibly caused by the state of MEFs and eliminates multiple steps needed for MEF preparation including culturing fibroblasts from mouse embryos and mitotic inactivation. Therefore, this feeder-free self-reprogramming system provides a simple and convenient tool to study the mechanism by which unipotent SSCs are induced into pluripotent cells. Fig. 1. (A, B) Conversion of SSCs into gPS cells under feeder-free conditions. (C, D) Established FF-gPS cells from Oct4-GFP–expressing colonies. (E) Immunofluorescence staining of SSEA1. (F) FF-gPS cells stained positive for alkaline phosphatase. Scale bars: 200 μm (A, B), 100 μm (C–F). Fig. 2. (A) RT-PCR analysis of the expression of pluripotency marker genes. The gene expression pattern of FF-gPS cells was comparable to those of mESCs and gPS cells. (B) Hierarchical analysis of mESCs, SSCs, MEFs, gPS cells, and FF-gPS cells. 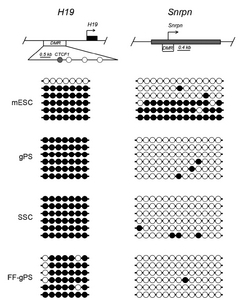 (C) Comparison of global gene expression between mESCs and SSCs (left), and between mESCs and FF-gPS cells (right). Passages: ESCs P43, SSCs P115, gPS P21, FF-gPS1 P5 and FF-gPS2 P10. Fig. 3. DNA methylation was analyzed by bisulfate genomic sequencing. Open and filled circles indicate unmethylated and methylated CpGs, respectively. DMR, differentially methylated region. Passages: ESCs P43, SSCs P115, gPS P21 and FF-gPS P10. Fig. 4. (A–C)In vitro differentiation. (A) Tuj1 (green), DAPI (B) SMA (green), DAPI. (C) AFP (green), DAPI. (D–F) In vivo differentiation. (D) Ectoderm (neural rosette). (E) Mesoderm (muscle). (F) Endoderm (gland). (G, H) beta-Gal staining of chimeric mouse. (I) Oct4-GFP–positive cells in a gonad. Scale bars: 25 μm (A–C), 100 μm (D–F). Brons, I.G., Smithers, L.E., Trotter, M.W., Rugg-Gunn, P., Sun, B., Chuva de Sousa Lopes, S.M., Howlett, S.K., Clarkson, A., Ahrlund-Richter, L., and Pedersen, R.A. (2007). Derivation of pluripotent epiblast stem cells from mammalian embryos. Nature. 448, 191-195. Brustle, O., Jones, K.N., Learish, R.D., Karram, K., Choudhary, K., Wiestler, O.D., Duncan, I.D., and McKay, R.D. (1999). Embryonic stem cell-derived glial precursors: a source of myelinating transplants. Science. 285, 754-756. Choi, N.Y., Park, Y.S., Ryu, J.S., Lee, H.J., Arauzo-Bravo, M.J., Ko, K., Han, D.W., Scholer, H.R., and Ko, K. (2014). A novel feeder-free culture system for expansion of mouse spermatogonial stem cells. Mol Cells. 37, 473-479. Dann, C.T., Alvarado, A.L., Molyneux, L.A., Denard, B.S., Garbers, D.L., and Porteus, M.H. (2008). Spermatogonial stem cell self-renewal requires OCT4, a factor downregulated during retinoic acid-induced differentiation. Stem Cells. 26, 2928-2937. Diaferia, G.R., Conti, L., Redaelli, S., Cattaneo, M., Mutti, C., DeBlasio, P., Dalpra, L., Cattaneo, E., and Biunno, I. (2011). Systematic chromosomal analysis of cultured mouse neural stem cell lines. Stem Cells Dev. 20, 1411-1423. Drukker, M., Tang, C., Ardehali, R., Rinkevich, Y., Seita, J., Lee, A.S., Mosley, A.R., Weissman, I.L., and Soen, Y. (2012). Isolation of primitive endoderm, mesoderm, vascular endothelial and trophoblast progenitors from human pluripotent stem cells. Nat Biotechnol. 30, 531-542. Fan, G., Wen, L., Li, M., Li, C., Luo, B., Wang, F., Zhou, L., and Liu, L. (2011). Isolation of mouse mesenchymal stem cells with normal ploidy from bone marrows by reducing oxidative stress in combination with extracellular matrix. BMC Cell Biol. 12, 30. Gaztelumendi, N., and Nogues, C. (2014). Chromosome instability in mouse embryonic stem cells. Sci Rep. 4, 5324. Hammerick, K.E., Huang, Z., Sun, N., Lam, M.T., Prinz, F.B., Wu, J.C., Commons, G.W., and Longaker, M.T. (2011). Elastic properties of induced pluripotent stem cells. Tissue Eng Part A. 17, 495-502. Igelmund, P., Fleischmann, B.K., Fischer, I.R., Soest, J., Gryshchenko, O., Bohm-Pinger, M.M., Sauer, H., Liu, Q., and Hescheler, J. (1999). Action potential propagation failures in long-term recordings from embryonic stem cell-derived cardiomyocytes in tissue culture. Pflugers Arch. 437, 669-679. Josse, C., Schoemans, R., Niessen, N.A., Delgaudine, M., Hellin, A.C., Herens, C., Delvenne, P., and Bours, V. (2010). Systematic chromosomal aberrations found in murine bone marrow-derived mesenchymal stem cells. Stem Cells Dev. 19, 1167-1173. Kanatsu-Shinohara, M., Ogonuki, N., Inoue, K., Miki, H., Ogura, A., Toyokuni, S., and Shinohara, T. (2003a). Long-term proliferation in culture and germline transmission of mouse male germline stem cells. Biol Reprod. 69, 612-616. Kanatsu-Shinohara, M., Ogonuki, N., Inoue, K., Ogura, A., Toyokuni, S., and Shinohara, T. (2003b). Restoration of fertility in infertile mice by transplantation of cryopreserved male germline stem cells. Hum Reprod. 18, 2660-2667. Kanatsu-Shinohara, M., Inoue, K., Lee, J., Yoshimoto, M., Ogonuki, N., Miki, H., Baba, S., Kato, T., Kazuki, Y., and Toyokuni, S. (2004). Generation of pluripotent stem cells from neonatal mouse testis. Cell. 119, 1001-1012. Kanatsu-Shinohara, M., Morimoto, H., and Shinohara, T. (2016). Enrichment of mouse spermatogonial stem cells by the stem cell dye CDy1. Biol Reprod. 94, 13. Kehler, J., Tolkunova, E., Koschorz, B., Pesce, M., Gentile, L., Boiani, M., Lomeli, H., Nagy, A., McLaughlin, K.J., and Scholer, H.R. (2004). Oct4 is required for primordial germ cell survival. EMBO Rep. 5, 1078-1083. Kim, J.B., Sebastiano, V., Wu, G., Arauzo-Bravo, M.J., Sasse, P., Gentile, L., Ko, K., Ruau, D., Ehrich, M., and van den Boom, D. (2009). Oct4-induced pluripotency in adult neural stem cells. Cell. 136, 411-419. Ko, K., Tapia, N., Wu, G., Kim, J.B., Bravo, M.J., Sasse, P., Glaser, T., Ruau, D., Han, D.W., and Greber, B. (2009). Induction of pluripotency in adult unipotent germline stem cells. Cell Stem Cell. 5, 87-96. Ko, K., Arauzo-Bravo, M.J., Kim, J., Stehling, M., and Scholer, H.R. (2010). Conversion of adult mouse unipotent germline stem cells into pluripotent stem cells. Nat Protoc. 5, 921-928. Ko, K., Wu, G., Arauzo-Bravo, M.J., Kim, J., Francine, J., Greber, B., Muhlisch, J., Joo, J.Y., Sabour, D., and Fruhwald, M.C. (2012). 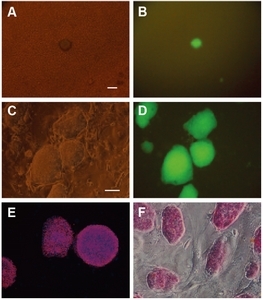 Autologous pluripotent stem cells generated from adult mouse testicular biopsy. Stem Cell Rev. 8, 435-444. Lee, S., Lee, H., Hwang, H., Ko, K., Han, D., and Ko, K. (2015). Optimization of Matrigel-based culture for expansion of neural stem cells. Anim Cell Syst. 19, 175-180. Li, Y., Zhang, Q., Yin, X., Yang, W., Du, Y., Hou, P., Ge, J., Liu, C., Zhang, W., and Zhang, X. (2011). Generation of iPSCs from mouse fibroblasts with a single gene, Oct4, and small molecules. Cell Res. 21, 196-204. Liu, X., Wu, H., Loring, J., Hormuzdi, S., Disteche, C.M., Bornstein, P., and Jaenisch, R. (1997). Trisomy eight in ES cells is a common potential problem in gene targeting and interferes with germ line transmission. Dev Dynamics. 209, 85-91. Luft, S., Pignalosa, D., Nasonova, E., Arrizabalaga, O., Helm, A., Durante, M., and Ritter, S. (2014). Fate of D3 mouse embryonic stem cells exposed to X-rays or carbon ions. Mutat Res Genet Toxicol Environ Mutagen. 760, 56-63. Miura, M., Miura, Y., Padilla-Nash, H.M., Molinolo, A.A., Fu, B., Patel, V., Seo, B.M., Sonoyama, W., Zheng, J.J., and Baker, C.C. (2006). Accumulated chromosomal instability in murine bone marrow mesenchymal stem cells leads to malignant transformation. Stem Cells. 24, 1095-1103. Niwa, H. (2001). Molecular mechanism to maintain stem cell renewal of ES cells. Cell Struct Funct. 26, 137-148. Page, J.L., Johnson, M.C., Olsavsky, K.M., Strom, S.C., Zarbl, H., and Omiecinski, C.J. (2007). Gene expression profiling of extracellular matrix as an effector of human hepatocyte phenotype in primary cell culture. Toxicol Sci. 97, 384-397. Pesce, M., and Scholer, H.R. (2000). Oct-4: control of totipotency and germline determination. Mol Reprod Dev. 55, 452-457. Rebuzzini, P., Neri, T., Mazzini, G., Zuccotti, M., Redi, C.A., and Garagna, S. (2008a). Karyotype analysis of the euploid cell population of a mouse embryonic stem cell line revealed a high incidence of chromosome abnormalities that varied during culture. Cytogenet Genome Res. 121, 18-24. Rebuzzini, P., Neri, T., Zuccotti, M., Redi, C.A., and Garagna, S. (2008b). Chromosome number variation in three mouse embryonic stem cell lines during culture. Cytotechnology. 58, 17-23. Rebuzzini, P., Pignalosa, D., Mazzini, G., Di Liberto, R., Coppola, A., Terranova, N., Magni, P., Redi, C.A., Zuccotti, M., and Garagna, S. (2012). Mouse embryonic stem cells that survive gamma-rays exposure maintain pluripotent differentiation potential and genome stability. J Cell Physiol. 227, 1242-1249. Rebuzzini, P., Zuccotti, M., Redi, C.A., and Garagna, S. (2015). Chromosomal abnormalities in embryonic and somatic stem cells. Cytogenet Genome Res. 147, 1-9. Scholer, H.R., Dressler, G.R., Balling, R., Rohdewohld, H., and Gruss, P. (1990). Oct-4: a germline-specific transcription factor mapping to the mouse t-complex. EMBO J. 9, 2185-2195. Tegelenbosch, R.A., and de Rooij, D.G. (1993). A quantitative study of spermatogonial multiplication and stem cell renewal in the C3H/101 F1 hybrid mouse. Mutat Res. 290, 193-200. Xu, C., Inokuma, M.S., Denham, J., Golds, K., Kundu, P., Gold, J.D., and Carpenter, M.K. (2001). Feeder-free growth of undifferentiated human embryonic stem cells. Nat Biotechnol. 19, 971-974. Xu, C., Jiang, J., Sottile, V., McWhir, J., Lebkowski, J., and Carpenter, M.K. (2004). Immortalized fibroblast-like cells derived from human embryonic stem cells support undifferentiated cell growth. Stem Cells. 22, 972-980.